Over the last few years, "geek" has become cool. From Kanye West to Justin Timberlake sporting large wide rim glasses and suspenders, vintage typewriters being sold in big-box home decorating stores, and just about everyone going ga-ga for technology, we are seeing "geek" pop up everywhere. We see a lot of literary references, too. 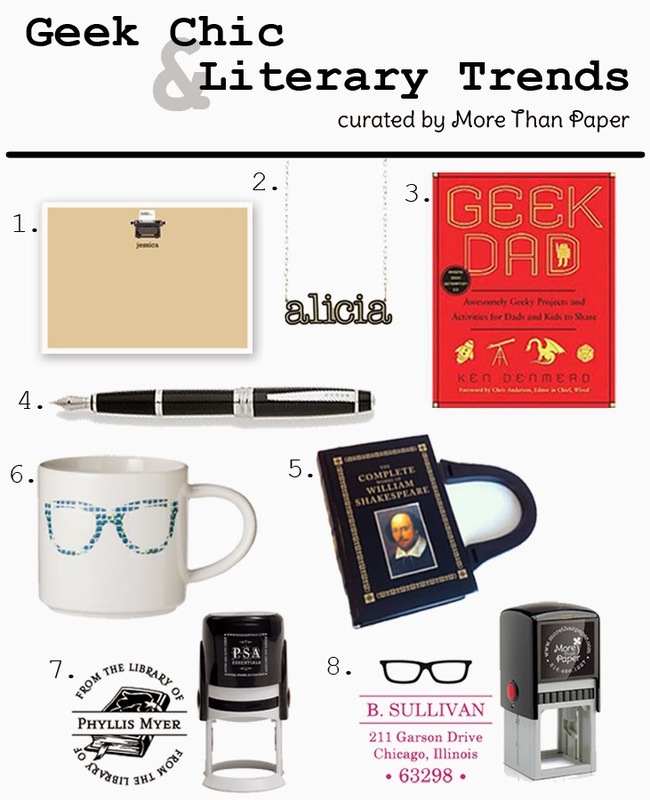 We've curated geek and literary items from all over the web and More Than Paper to show these trends! Embrace the big glasses, books, and typewriters! Find these products here! Stamp your geek glasses on your envelopes and make your mark in your books. Remind yourself how cool you really are when you sip your chai tea latte, or as you dash to the subway to work. Recall the nostalgia of writing on a typewritter when sending a handwritten note with your fountain pen! 1. Flat Typewriter note by Boatman Geller 2. Silver Name Necklace 3. Paperback book "Geek Dad." 4. Fountain Pen 5. Book Purse 6. Ceramic Coffee Mug 7. PSA Essentials Book Personalized Stamp 8. Stamper With Glasses by More Than Paper. Tell us what you think of this trend -- are you geeking out too?